“When the Festival Board asked if I would be the 2019 Image Maker, I knew I had to deliver a piece that would be worthy of such a prestigious organization. That’s when I opened my mind to the possibilities of what the Festival meant to me and what it represents to the community. I opened my mind and eyes to whatever symbol presented itself, and it did in abundance. I began to see Dragonflies everywhere. 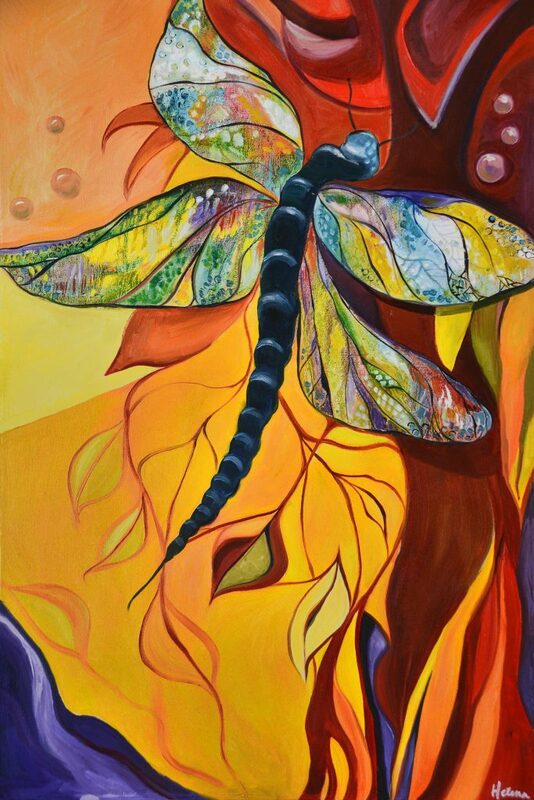 In every part of the world the Dragonfly symbolizes change, transformation, adaptability and self realization, things I associate with the Festival. The Dragonfly’s scurrying flight across water represents the act of going beyond what’s on the surface and look deeper into the implications and aspects of life. There is elegance and grace in its iridescent wings and body. A dragonfly only flies for a fraction of its life. This symbolizes and exemplifies the virtue of living in the moment and living life to the fullest. By living in the moment, you are aware of who you are, what you are doing, what you want and what you don’t and to make informed choices on a moment to moment basis. I apply this new-found beauty to my own life and the new journey I find myself on. While creating this piece of art I had two palpable forms of energy near me at all times, the spirit of the original champion of the festival image maker, Kareen Burns and another special woman Gillian Brunette, both who lived their lives to the fullest, gave their energy to the Festival and left us all much too soon. I dedicate this piece to the memory of both these beautiful women.